Learning to drive a car is no simple task. When you’re sitting in the driver’s seat, you’re in control of a two ton vehicle that can move very quickly. That’s why there are so many rules and laws that we need to follow when it comes to driving. They keep us, other people, and the surrounding property safe. Even though you need to pass a road test before you get your driver’s license, there seem to be many people who forget all the rules of the road by the time they are are adults. Then there are other people who know the laws but just don’t care. For one reason or another, they decide to drive their car their way, whether or not it’s safe or legal. Here are some people who took bad driving to the extreme. They were caught driving or parking so badly that they make us wonder if we should really just stay off the road. 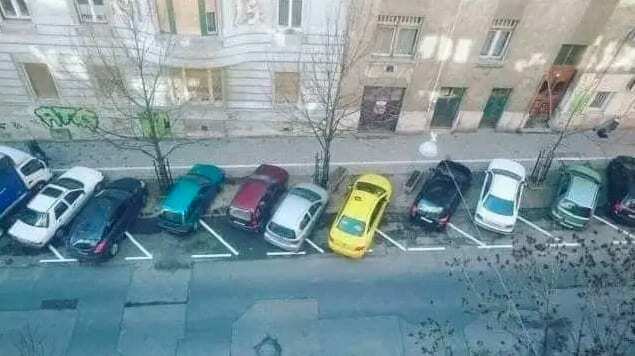 When you are parking a car, it’s important to park between the lines. You want to make sure that you stay within your own parking space so that other cars can park on either side of you, and so that you have room to exit your car without smashing your door into the neighboring cars. It often takes a lot of practice to master the skill of parking. 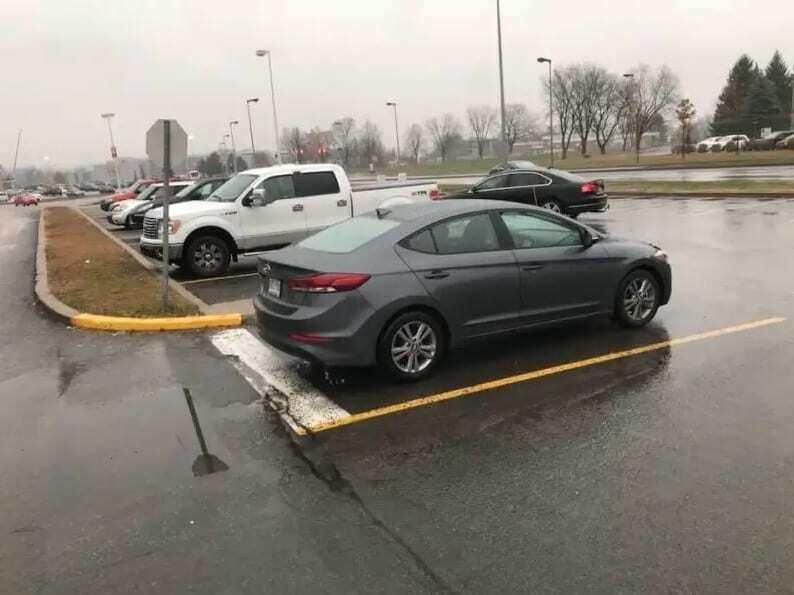 This person definitely parked between the lines – but they neglected to make sure they were the correct lines to park between! This is in no way a parking spot, and the car is blocking the exit to the parking lot. 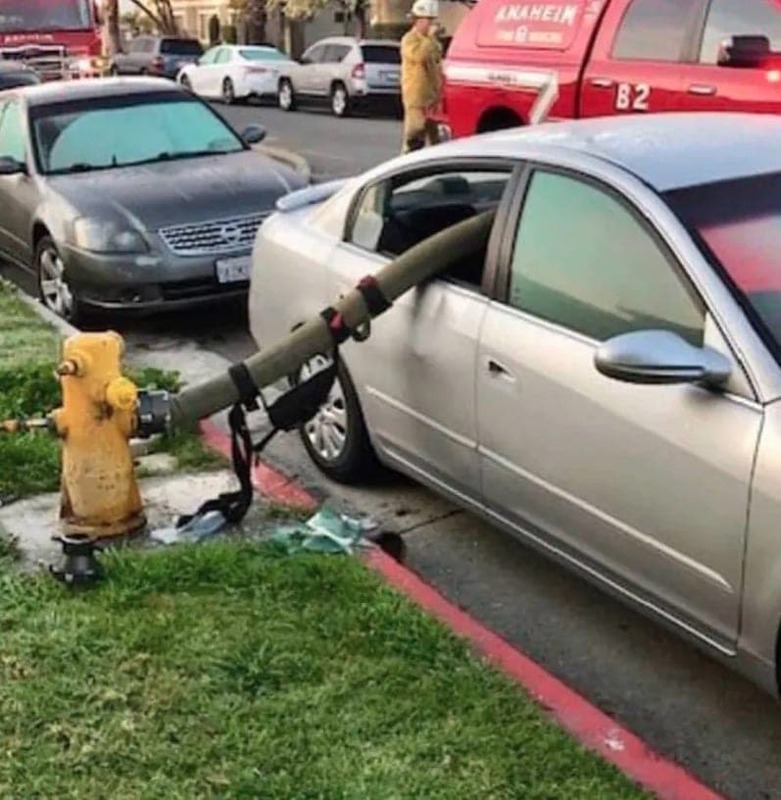 Everyone knows that you’re not allowed to park in front of a fire hydrant, and there’s a very good reason for this. On the off chance that there is a fire, the fire fighters need to be able to access the nearest fire hydrant in order to put out the fire. If something, like a vehicle for example, is blocking the fire hydrant, it can make putting out the fire much more difficult. The driver who parked their car here probably assumed that the chances of a house going up in flames were pretty slim, but that was clearly a mistake in retrospect. Now, they have to deal with two broken windows and probably a pretty hefty fine. Having a clear view of the road is a very important requirement for driving safely. That’s why we have big windshields on the front of our cars, and windshield wipers to clean them off when it rains or they start to get dirty. If you live in a place where it snows frequently, you get used to the weather and don’t let it interrupt your daily routine. You still need to factor several extra minutes into your morning to clear off your car before you head to work. 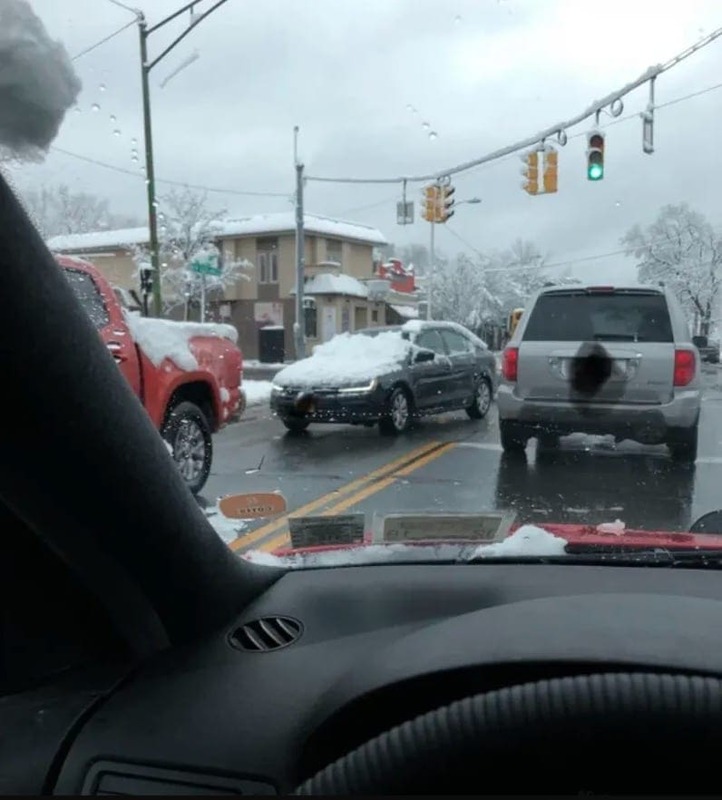 This driver skipped that crucial step, and their windshield is completely covered in snow! There’s no way they can see the road, and that looks way dangerous to us! As trucks get longer, they need more wheels to support all of their weight. Those big trucks on the road typically have 18 wheels, hence the name 18-wheeler. It gives them the strength and control to dive safely, even with a heavy load. 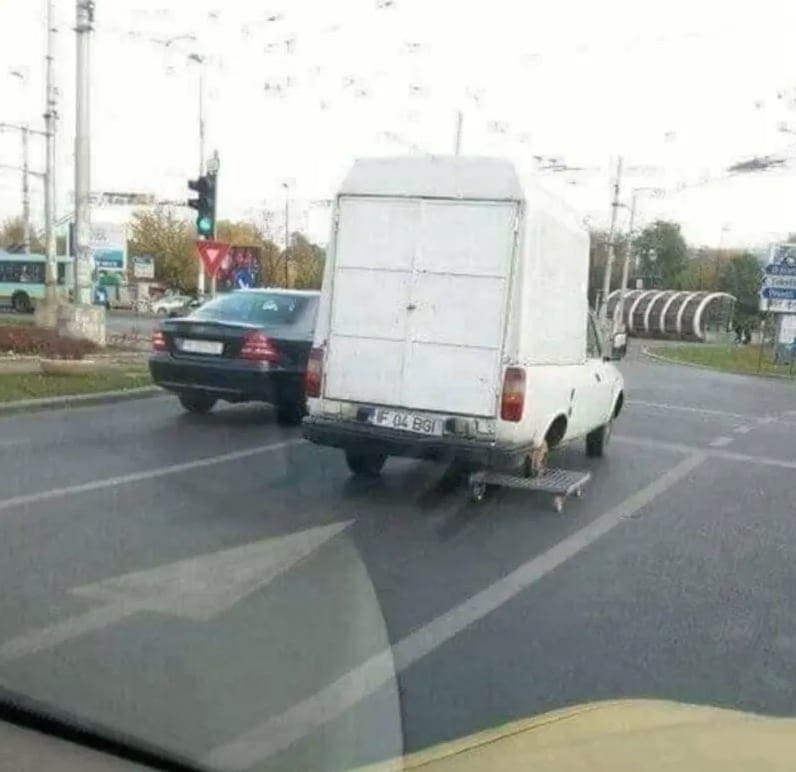 That being said, adding wheels to a smaller vehicle is definitely not going to make it work better, especially when those wheels aren’t made for the road. This tow truck seems to have lost a tire, and instead of replacing it, the driver hoisted the broken wheel up onto a four-wheeled dolly. We’re pretty sure that it’s only a matter of time before something goes wrong with this contraption! This driver gave the term “drive through” a whole new meaning! From the looks of it, they were determined to make it through the gate even though it was on its way down. The car must have sped up to try to make it through the closing space, but just couldn’t get there in time. Instead, the car went right through the metal bars, bending the metal gate as if it were made of paper clips. 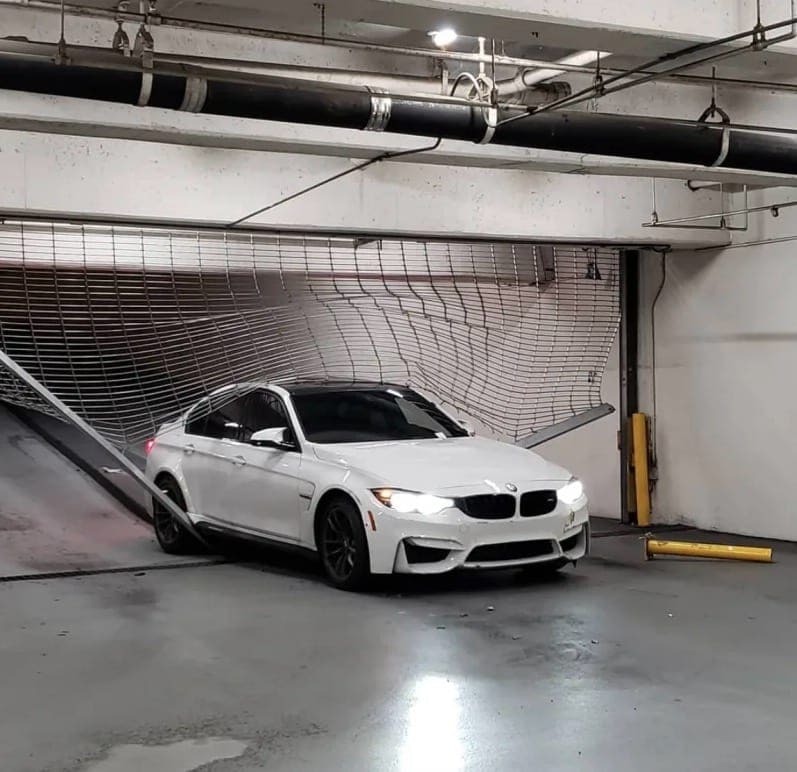 Miraculously, the car doesn’t even look too scratched up or damaged, leading us to wonder if maybe this parking garage should invest in a heavier gate. Still, the gate stopped the car so it did its job. Some people with really luxurious cars seem to think that they have the right to park wherever they want. Nobody will dare tow their car because if they scratch such an expensive car even a little bit, the owner can sue them. 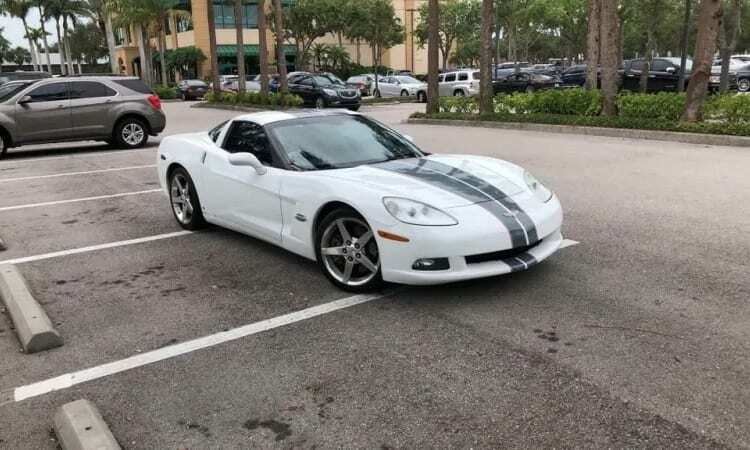 This overconfident Corvette owner went ahead and just stopped their car so it was blocking three whole parking spaces. In fact, it’s so badly done that we’re not sure if it can even be called parking. Usually, when someone has to move a large object from one place to another, they rent or borrow a truck to transport it. This driver decided that it wasn’t necessary to find a vehicle that could actually fit their refrigerator, and they just went right ahead and moved it in the trunk of a compact car. 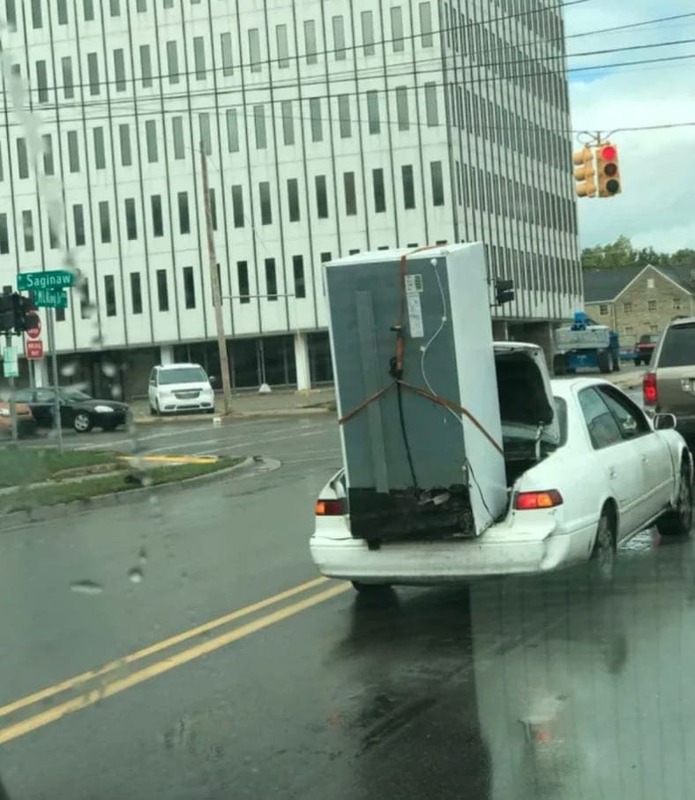 Not only does this look ridiculous, the fridge is also quite precariously perched, and we sure wouldn’t want to be driving behind it in case it falls off. Apparently, the person driving this SUV decided that the drive thru service window was an acceptable place to leave their car when they ran into the bank to use the restroom. It wasn’t so convenient for the people behind them in line, though. The person who snapped this photograph was patiently waiting for their turn at the window but they had a long wait ahead of them. 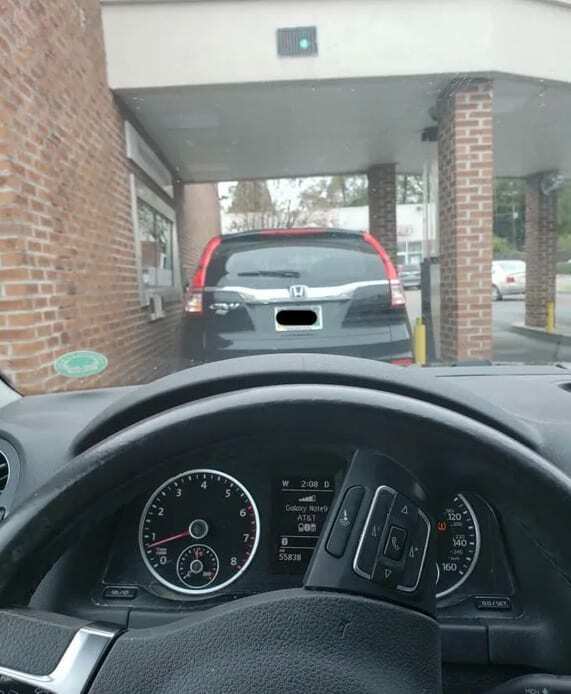 This kind of behavior is incredibly inconsiderate and we would not want to be stuck behind them at a drive thru. If you live in a big city, chances are you know the struggles of driving around and around late at night looking for a parking place. You just want to park your car and go home, but you also don’t want to get a ticket. From the looks of it, the owner of this car had enough and decided that they no longer cared about parking legally. We get it, but we imagine that there will be a big ole ticket on the car come morning. When you park too close to another car, it makes it impossible to get out of your car. Sometimes, when the parking lot is completely full and the only open spot you can find requires some careful maneuvering, it’s acceptable to park like that. However, when the lot is empty and another driver still feels the need to pull up really close, it can be a bit bothersome. 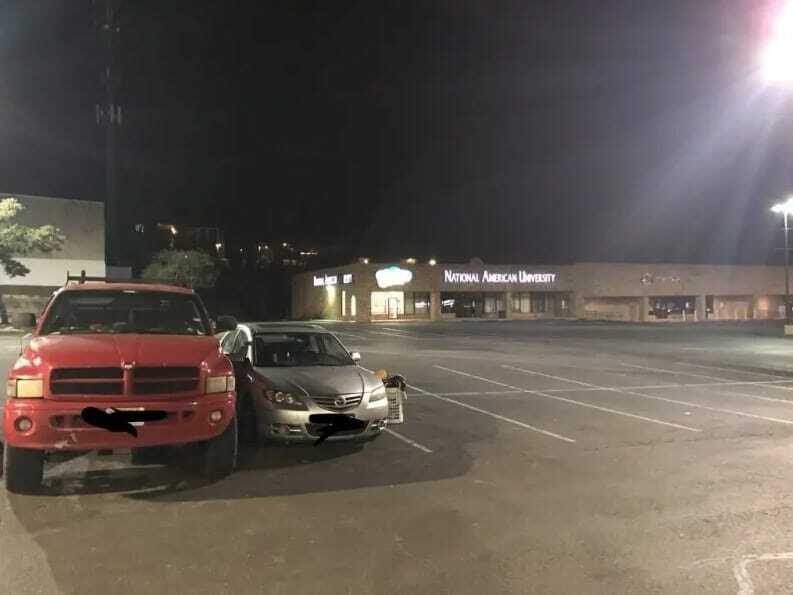 We hope there’s a good reason why these two vehicles are parked so close together in an empty parking lot. 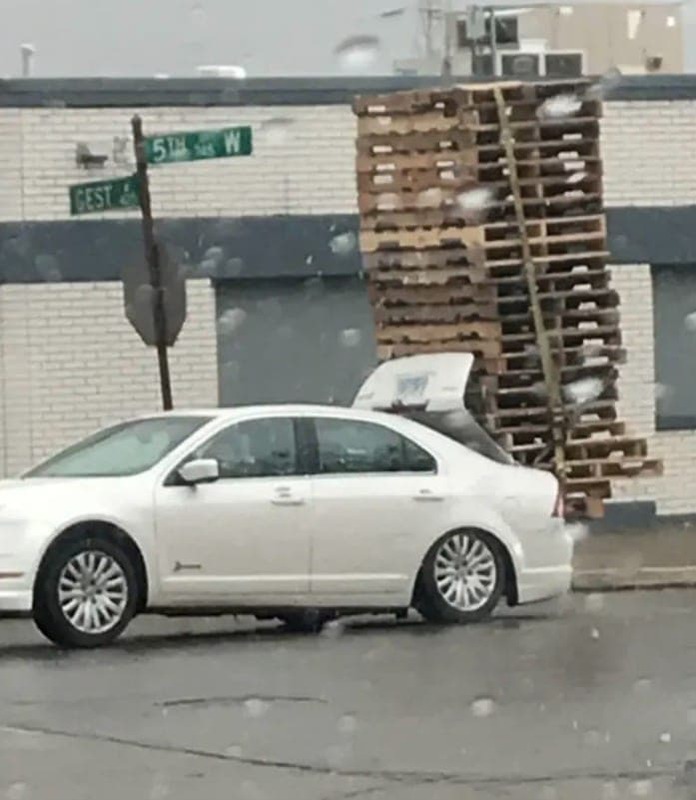 It looks nearly impossible to drive with this stack of pallets hanging out of the trunk! This is not the way that we would advise transporting these items from place to place. It’s way too precariously stacked and we honestly have no idea how this driver made it even as far as they did. We also wouldn’t want to be caught on the road behind this car because we would be terrified that they would all come crashing down on top of us. This is clearly a case of someone intentionally ignoring the rules. This parking spot is very narrow, so it is reserved for a compact car. That information is communicated to drivers through the words printed on the ground. The owner of this massive vehicle just didn’t care. Maybe there were no other spots, or maybe they just didn’t want to drive around anymore. 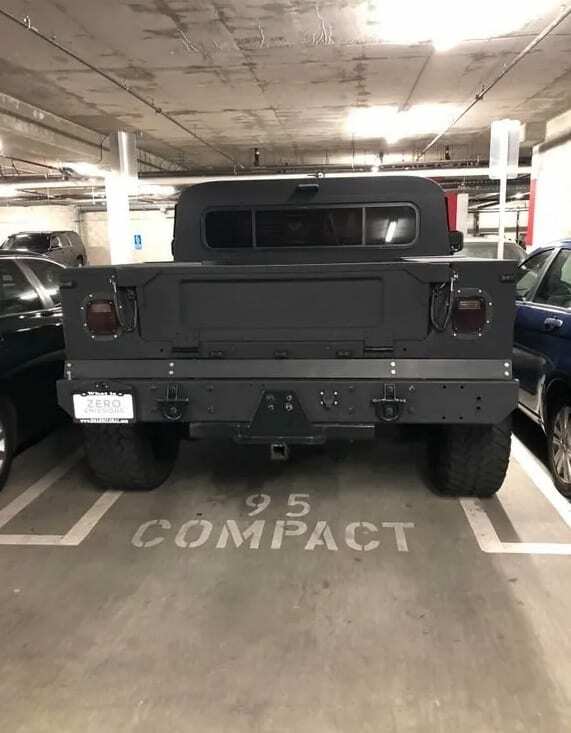 Even though there was absolutely no chance that their Hummer would fit between the lines, they still managed to wedge it into the parking spot. Everything about this parking job is shameful. First of all, the area of the parking lot where you are supposed to put your shopping carts is decidedly not a parking space. Parking there is obviously not permitted. 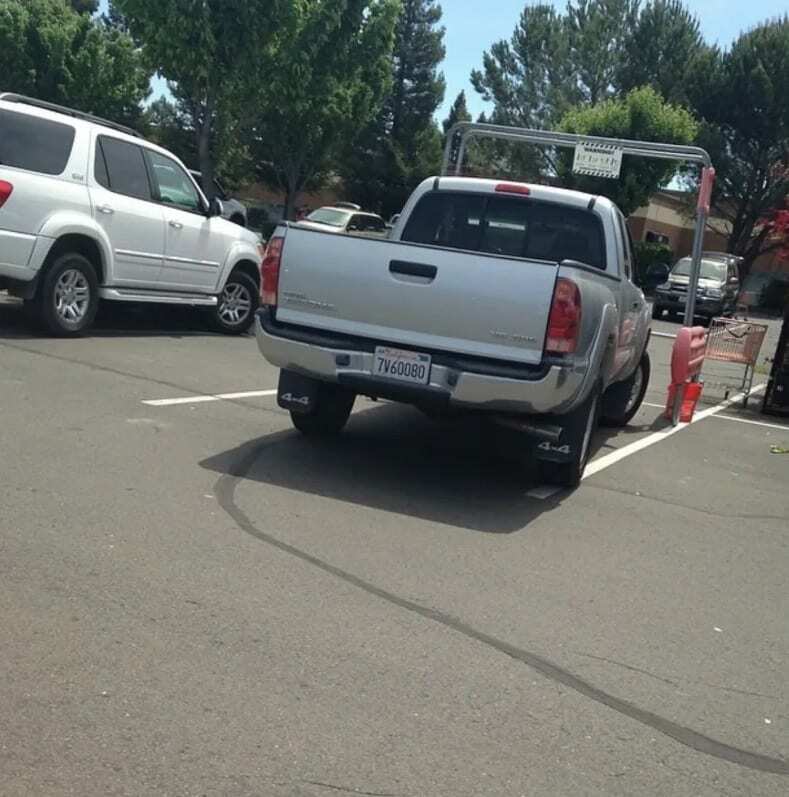 In addition, the driver of this pickup truck parked right on top of the white line. Even if this was a real parking spot, this driver still would have failed to park properly. They need several more driving lessons before they should be allowed on the road. Parallel parking is not always easy. It’s one of those skills that takes some time to develop. When you have to pull into a tight spot by the curb between two other cars, it’s understandable if it’s a little tough to park perfectly. However, this driver didn’t even need to parallel park – they just needed to pull over on the side, and they didn’t even do that properly. They are so far from the curb that they seem to have just stopped in the middle of the road. 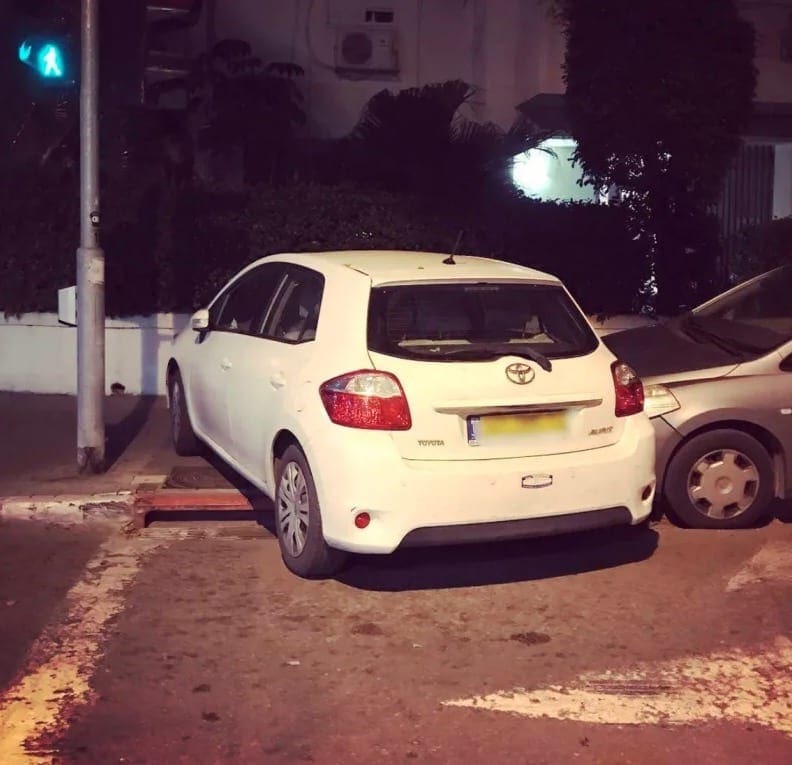 This isn’t your standard bad parking job – it’s much worse than that. For some reason, this driver thought it would be okay to park on the path to the helipad. This is not only rude and inconsiderate, it’s also dangerous! 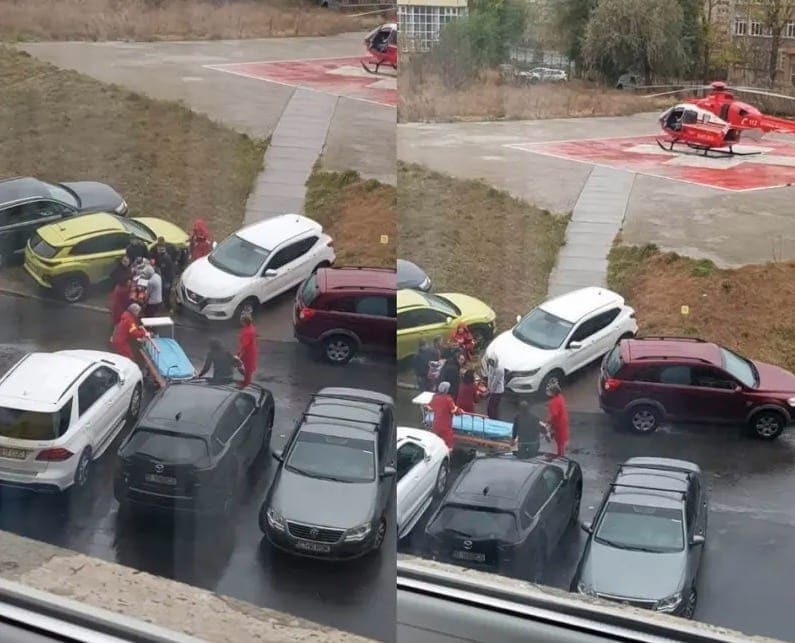 If there’s an emergency, the rescue team needs to be able to get to and from the helicopter as fast as possible, likely with a stretcher in tow. If there’s a car in the way, it makes their job that much more difficult. 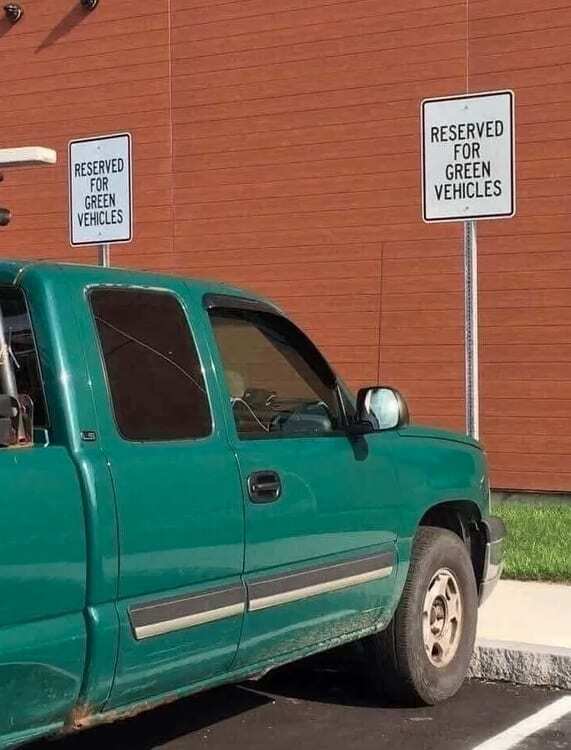 When the sign says, “Reserved for green vehicles,” it’s talking about green as in environmentally friendly. You see, a lot of companies and organizations are trying to prioritize cars with lower emissions to help save the planet, so they offer those who drive them perks like better parking spots. 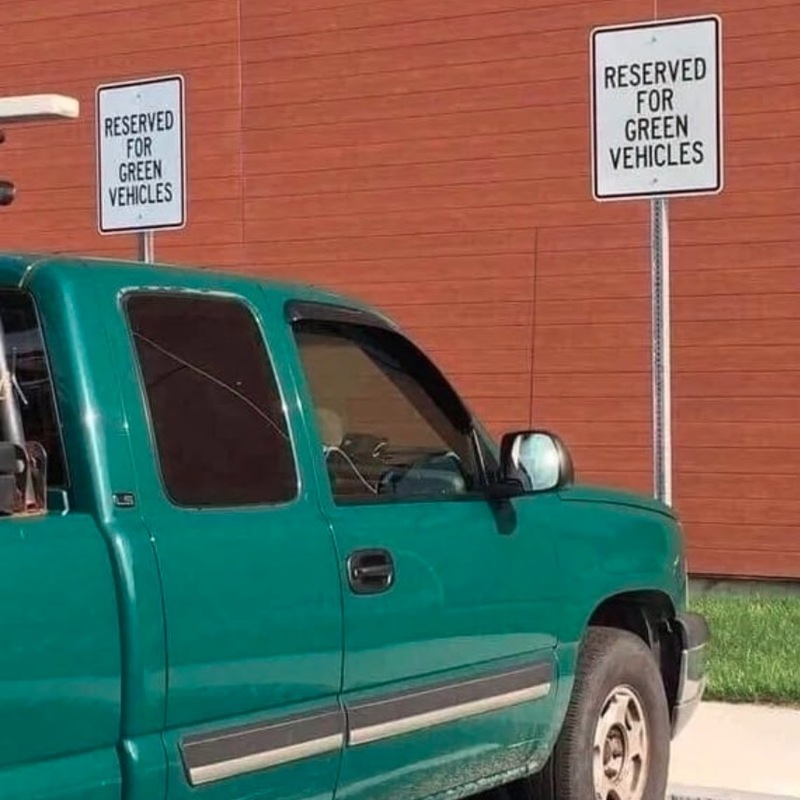 This pickup truck is definitely not green in that sense of the word, but it is the color green. We’re not sure if this driver can be ticketed for parking here, because they are technically following the rules. For some reason, every single car on this block parked in the wrong direction. 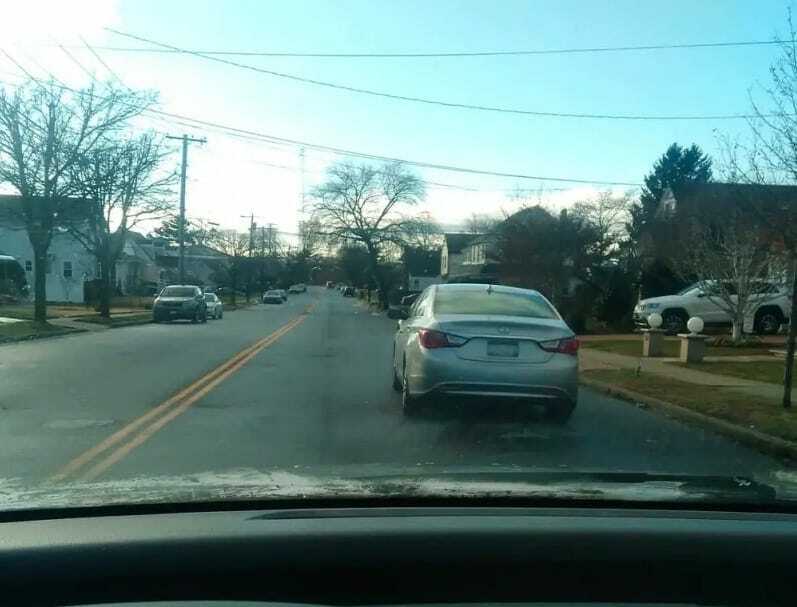 The lines on the road are very clearly pointing to the left, but every driver parked with their cars pointing to the right. We don’t know if this is a regular occurrence in this neighborhood, but now that everyone is facing the wrong way it’s going to be pretty challenging to get them back in the other direction. At this point, it might be simpler to just repaint the lines. Feral cats – friend or foe?